35:0.1 THE SONS OF GOD previously introduced have had a Paradise origin. They are the offspring of the divine Rulers of the universal domains. Of the first Paradise order of sonship, the Creator Sons, there is in Nebadon only one, Michael, the universe father and sovereign. Of the second order of Paradise sonship, the Avonal or Magisterial Sons, Nebadon has its full quota—1,062. And these “lesser Christs” are just as effective and all-powerful in their planetary bestowals as was the Creator and Master Son on Urantia. The third order, being of Trinity origin, do not register in a local universe, but I estimate there are in Nebadon between fifteen and twenty thousand Trinity Teacher Sons exclusive of 9,642 creature-trinitized assistants of record. These Paradise Daynals are neither magistrates nor administrators; they are superteachers. 35:0.7 Triune Paradise Deity functions for the creation of three orders of sonship: the Michaels, the Avonals, and the Daynals. Dual Deity in the local universe, the Son and the Spirit, also functions in the creation of three high orders of Sons: the Melchizedeks, the Vorondadeks, and the Lanonandeks; and having achieved this threefold expression, they collaborate with the next level of God the Sevenfold in the production of the versatile order of Life Carriers. These beings are classified with the descending Sons of God, but they are a unique and original form of universe life. Their consideration will occupy the whole of the next paper. 35:1.1 After bringing into existence the beings of personal aid, such as the Bright and Morning Star and other administrative personalities, in accordance with the divine purpose and creative plans of a given universe, there occurs a new form of creative union between the Creator Son and the Creative Spirit, the local universe Daughter of the Infinite Spirit. The personality offspring resulting from this creative partnership is the original Melchizedek—the Father Melchizedek—that unique being who subsequently collaborates with the Creator Son and the Creative Spirit to bring into existence the entire group of that name. 35:1.2 In the universe of Nebadon the Father Melchizedek acts as the first executive associate of the Bright and Morning Star. Gabriel is occupied more with universe policies, Melchizedek with practical procedures. Gabriel presides over the regularly constituted tribunals and councils of Nebadon, Melchizedek over the special, extraordinary, and emergency commissions and advisory bodies. Gabriel and the Father Melchizedek are never away from Salvington at the same time, for in Gabriel’s absence the Father Melchizedek functions as the chief executive of Nebadon. 35:1.3 The Melchizedeks of our universe were all created within one millennial period of standard time by the Creator Son and the Creative Spirit in liaison with the Father Melchizedek. 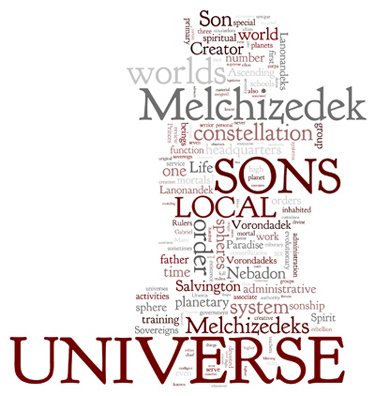 Being an order of sonship wherein one of their own number functioned as co-ordinate creator, Melchizedeks are in constitution partly of self-origin and therefore candidates for the realization of a supernal type of self-government. They periodically elect their own administrative chief for a term of seven years of standard time and otherwise function as a self-regulating order, though the original Melchizedek does exercise certain inherent coparental prerogatives. From time to time this Father Melchizedek designates certain individuals of his order to function as special Life Carriers to the midsonite worlds, a type of inhabited planet not heretofore revealed on Urantia. 35:1.4 The Melchizedeks do not function extensively outside the local universe except when they are called as witnesses in matters pending before the tribunals of the superuniverse, and when designated special ambassadors, as they sometimes are, representing one universe to another in the same superuniverse. The original or first-born Melchizedek of each universe is always at liberty to journey to the neighboring universes or to Paradise on missions having to do with the interests and duties of his order. 35:2.2 The Melchizedek are a self-governing order. With this unique group we encounter the first attempt at self-determination on the part of local universe beings and observe the highest type of true self-government. These Sons organize their own machinery for their group and home-planet administration, as well as that for the six associated spheres and their tributary worlds. And it should be recorded that they have never abused their prerogatives; not once throughout all the superuniverse of Orvonton have these Melchizedek Sons ever betrayed their trust. They are the hope of every universe group which aspires to self-government; they are the pattern and the teachers of self-government to all the spheres of Nebadon. All orders of intelligent beings, superiors from above and subordinates from below, are wholehearted in their praise of the government of the Melchizedeks. 35:3.1 The Melchizedeks occupy a world of their own near Salvington, the universe headquarters. This sphere, by name Melchizedek, is the pilot world of the Salvington circuit of seventy primary spheres, each of which is encircled by six tributary spheres devoted to specialized activities. These marvelous spheres—seventy primaries and 420 tributaries—are often spoken of as the Melchizedek University. Ascending mortals from all the constellations of Nebadon pass through training on all 490 worlds in the acquirement of residential status on Salvington. But the education of ascenders is only one phase of the manifold activities taking place on the Salvington cluster of architectural spheres. 35:3.10 The six tributary worlds of each of these Melchizedek spheres are devoted to activities germane to the work of the associated primary sphere. 35:3.11 The pilot world, the sphere Melchizedek, is the common meeting ground for all beings who are engaged in educating and spiritualizing the ascending mortals of time and space. To an ascender this world is probably the most interesting place in all Nebadon. All evolutionary mortals who graduate from their constellation training are destined to land on Melchizedek, where they are initiated into the regime of the disciplines and spirit progression of the Salvington educational system. And never will you forget your reactions to the first day of life on this unique world, not even after you have reached your Paradise destination. 35:3.12 Ascending mortals maintain residence on the Melchizedek world while pursuing their training on the six encircling planets of specialized education. And this same method is adhered to throughout their sojourn on the seventy cultural worlds, the primary spheres of the Salvington circuit. 35:3.20 The schools of universe administration and spiritual wisdom are located on the Melchizedek home world, where also are to be found those schools devoted to a single line of research, such as energy, matter, organization, communication, records, ethics, and comparative creature existence. 35:3.21 In the Melchizedek College of Spiritual Endowment all orders—even the Paradise orders—of the Sons of God co-operate with the Melchizedek and the seraphic teachers in training the hosts who go forth as evangels of destiny, proclaiming spiritual liberty and divine sonship even to the remote worlds of the universe. This particular school of the Melchizedek University is an exclusive universe institution; student visitors are not received from other realms. 35:3.22 The highest course of training in universe administration is given by the Melchizedeks on their home world. This College of High Ethics is presided over by the original Father Melchizedek. It is to these schools that the various universes send exchange students. While the young universe of Nebadon stands low in the scale of universes as regards spiritual achievement and high ethical development, nevertheless, our administrative troubles have so turned the whole universe into a vast clinic for other near-by creations that the Melchizedek colleges are thronged with student visitors and observers from other realms. Besides the immense group of local registrants there are always upward of one hundred thousand foreign students in attendance upon the Melchizedek schools, for the order of Melchizedeks in Nebadon is renowned throughout all Splandon. 35:4.3 When failure of some feature of the Creator Son’s plan is threatened, forthwith will go a Melchizedek to render assistance. But not often are they summoned to function in the presence of sinful rebellion, such as occurred in Satania. 35:6.1 At least three Vorondadeks are assigned to the rulership of each of the one hundred constellations of a local universe. These Sons are selected by the Creator Son and are commissioned by Gabriel as the Most Highs of the constellations for service during one dekamillennium—10,000 standard years, about 50,000 years of Urantia time. The reigning Most High, the Constellation Father, has two associates, a senior and a junior. At each change of administration the senior associate becomes the head of the government, the junior assumes the duties of the senior, while the unassigned Vorondadeks resident on the Salvington worlds nominate one of their number as candidate for selection to assume the responsibilities of junior associate. Thus each of the Most High rulers, in accordance with present policy, has a period of service on the headquarters of a constellation of three dekamillenniums, about 150,000 Urantia years. 35:6.2 The one hundred Constellation Fathers, the actual presiding heads of the constellation governments, constitute the supreme advisory cabinet of the Creator Son. This council is in frequent session at universe headquarters and is unlimited in the scope and range of its deliberations but is chiefly concerned with the welfare of the constellations and with the unification of the administration of the entire local universe. 35:6.4 The entire mechanism of spirit intelligence and communication channels is at the disposal of the constellation Most Highs. They are in perfect touch with their superiors on Salvington and with their direct subordinates, the sovereigns of the local systems. They frequently convene in council with these System Sovereigns to deliberate upon the state of the constellation. 35:6.5 The Most Highs surround themselves with a corps of counselors, which varies in number and personnel from time to time in accordance with the presence of the various groups at constellation headquarters and also as the local requirements vary. During times of stress they may ask for, and will quickly receive, additional Sons of the Vorondadek order to assist with the administrative work. Norlatiadek, your own constellation, is at present administered by twelve Vorondadek Sons. 35:7.1 The second group of seven worlds in the circuit of seventy primary spheres surrounding Salvington comprise the Vorondadek planets. Each of these spheres, with its six encircling satellites, is devoted to a special phase of Vorondadek activities. On these forty-nine realms the ascending mortals secure the acme of their education respecting universe legislation. 35:7.2 The ascending mortals have observed the legislative assemblies as they functioned on the headquarters worlds of the constellations, but here on these Vorondadek worlds they participate in the enactment of the actual general legislation of the local universe under the tutelage of the senior Vorondadeks. Such enactments are designed to co-ordinate the varied pronouncements of the autonomous legislative assemblies of the one hundred constellations. The instruction to be had in the Vorondadek schools is unexcelled even on Uversa. This training is progressive, extending from the first sphere, with supplemental work on its six satellites, on up through the remaining six primary spheres and their associated satellite groups. 35:7.3 The ascending pilgrims will be introduced to numerous new activities on these worlds of study and practical work. We are not forbidden to undertake the revelation of these new and undreamed-of pursuits, but we despair of being able to portray these undertakings to the material mind of mortal beings. We are without words to convey the meanings of these supernal activities, and there are no analogous human engagements which might be utilized as illustrations of these new occupations of the ascending mortals as they pursue their studies on these forty-nine worlds. And many other activities, not a part of the ascendant regime, are centered on these Vorondadek worlds of the Salvington circuit. 35:8.15 Since Lanonandeks are a somewhat lower order of sonship than the Melchizedeks and the Vorondadeks, they are of even greater service in the subordinate units of the universe, for they are capable of drawing nearer the lower creatures of the intelligent races. They also stand in greater danger of going astray, of departing from the acceptable technique of universe government. But these Lanonandeks, especially the primary order, are the most able and versatile of all local universe administrators. In executive ability they are excelled only by Gabriel and his unrevealed associates. 35:9.1 The Lanonandeks are the continuous rulers of the planets and the rotating sovereigns of the systems. Such a Son now rules on Jerusem, the headquarters of your local system of inhabited worlds. 35:9.2 The System Sovereigns rule in commissions of two or three on the headquarters of each system of inhabited worlds. The Constellation Father names one of these Lanonandeks as chief every dekamillennium. Sometimes no change in the head of the trio is made, the matter being entirely optional with the constellation rulers. System governments do not suddenly change in personnel unless a tragedy of some sort occurs. 35:9.3 When System Sovereigns or assistants are recalled, their places are filled by selections made by the supreme council located on the constellation headquarters from the reserves of that order, a group which is larger on Edentia than the average indicated. 35:9.4 The supreme Lanonandek councils are stationed on the various constellation headquarters. Such a body is presided over by the senior Most High associate of the Constellation Father, while the junior associate supervises the reserves of the secondary order. 35:9.5 The System Sovereigns are true to their names; they are well-nigh sovereign in the local affairs of the inhabited worlds. They are almost paternal in their direction of the Planetary Princes, the Material Sons, and the ministering spirits. The personal grasp of the sovereign is all but complete. These rulers are not supervised by Trinity observers from the central universe. They are the executive division of the local universe, and as custodians of the enforcement of legislative mandates and as executives for the application of judicial verdicts, they present the one place in all universe administration where personal disloyalty to the will of the Michael Son could most easily and readily intrench itself and seek to assert itself. 35:9.6 Our local universe has been unfortunate in that over seven hundred Sons of the Lanonandek order have rebelled against the universe government, thus precipitating confusion in several systems and on numerous planets. Of this entire number of failures only three were System Sovereigns; practically all of these Sons belonged to the second and third orders, Planetary Princes and tertiary Lanonandeks. 35:9.7 The large number of these Sons who have lapsed from integrity does not indicate any fault in creatorship. They could have been made divinely perfect, but they were so created that they might better understand, and draw near to, the evolutionary creatures dwelling on the worlds of time and space. 35:9.8 Of all the local universes in Orvonton, our universe has, with the exception of Henselon, lost the largest number of this order of Sons. On Uversa it is the consensus that we have had so much administrative trouble in Nebadon because our Sons of the Lanonandek order have been created with such a large degree of personal liberty in choosing and planning. I do not make this observation by way of criticism. The Creator of our universe has full authority and power to do this. It is the contention of our high rulers that, while such free-choosing Sons make excessive trouble in the earlier ages of the universe, when things are fully sifted and finally settled, the gains of higher loyalty and fuller volitional service on the part of these thoroughly tested Sons will far more than compensate for the confusion and tribulations of earlier times. 35:9.9 In the event of rebellion on a system headquarters, a new sovereign is usually installed within a comparatively short time, but not so on the individual planets. They are the component units of the material creation, and creature free will is a factor in the final adjudication of all such problems. Successor Planetary Princes are designated for isolated worlds, planets whose princes of authority may have gone astray, but they do not assume active rulership of such worlds until the results of insurrection are partially overcome and removed by the remedial measures adopted by the Melchizedeks and other ministering personalities. Rebellion by a Planetary Prince instantly isolates his planet; the local spiritual circuits are immediately severed. Only a bestowal Son can re-establish interplanetary lines of communication on such a spiritually isolated world. 35:9.10 There exists a plan for saving these wayward and unwise Sons, and many have availed themselves of this merciful provision; but never again may they function in those positions wherein they defaulted. After rehabilitation they are assigned to custodial duties and to departments of physical administration.